How Do I Know if I am Dealing with an Eating Disorder? Eating disorders are the intentional purging, withholding, or binging of food. Eating disorders are really about that internal feelings, self-esteem, and poor self worth. Eating disorders affect weight, but are not solely based on weight, appearance, and calorie control. Having an eating disorder is also about maintaining control over food because other areas of life are out of control. There is a connection between trauma and eating disorders, although trauma is not always a cause. Having an eating disorder can be fatal or cause serious health consequences. Treatment is incredibly important if you or someone you love is living with an eating disorder. 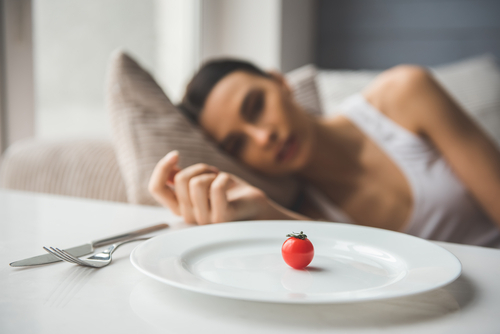 There are several types of eating disorders ranging from food restriction to overindulgence. Bulimia, Binge eating, Anorexia are just a few. Binge eating is characterized by overeating to extreme levels. Those with binge eating disorders do not purge and may be obese. Obesity also comes with health problems such as high blood pressure, diabetes, and cardiovascular diseases. Individuals with Anorexia Nervosa view themselves as overweight, even though they are significantly underweight to the point of serious medical complications. Those with anorexia are obsessive about calorie restriction, if they even eat at all. Individuals with anorexia may weigh themselves repeatedly and be obsessed with their weight. Of all mental health issues, anorexia has the highest rates of mortality. Bulimia Nervosa is characterized by overeating and then some form of purging. Individuals with bulimia may not appear underweight, however this illness also comes with health risks. Someone with bulimia may eat large quantities of food and then induce vomiting or use laxatives to get rid of the food they consumed. If any of these signs or symptoms sound like you or a family, help is available. Eating disorders can be treated with family and individual therapy, medications, and inpatient treatment. Eating disorders are treatable with dedication and work. Hired Power is an expert in bringing compassion to treatment. If you want to learn more about help for an eating disorder, call Hired Power today at 714-559-3919. Hired Power is the expert you need to help you heal.